Smallest of the rhinoceros species, the Sumatran rhinoceros has two horns like its African counterpart. They are found only in Sumatra (Indonesia), Sabah (on the northern end of Borneo), Peninsular Malaysia and possibly in southern Thailand. Believed to be fewer than 300 individuals left in the world due to poaching and habitat fragmentation, Sumatran rhinos are critically endangered. The subspecies in Peninsular Malaysia (Dicerorhinus sumatrensis) is the same as that found in Sumatra and Thailand. 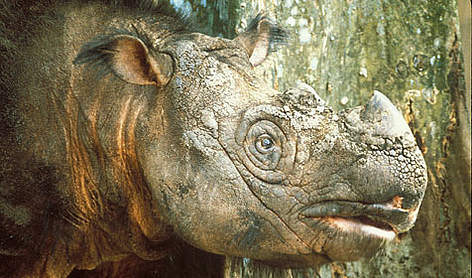 The Borneo form is a separate subspecies (Dicerorhinus sumatrensis harrissoni) with different physical characteristics. Previous estimates suggest that there were 60 rhinos in Peninsular Malaysia and around 30 to 70 rhinos on the island of Borneo, all in Sabah. However, a survey conducted in 2005 found evidence of only 13 rhinos in Sabah’s interior! It’s a good thing scattered individuals still survive in other parts of Sabah. The Sumatran rhinoceros is the last surviving species in the same group as the extinct woolly rhinoceros. It is also one of the world's rarest mammals. It lives in a variety of forests, but prefers lowlands with small hills and valleys. These rhinos spend much of their day in mud wallows, which they dig out themselves, to avoid biting insects and protect themselves from the heat. Rhinos spend their lives in remote forests where they are rarely seen, which accounts for the lack of any previous photographs of them in the wild. These animals are very shy and are almost never seen in the wild. The Sumatran rhino is a strict forest-dweller - venturing out of forest cover only in unusual situations unlike other rhino species or large herbivorous mammals in Borneo such as elephants, wild cattle and deer. Typically, a mature Sumatran rhino stands about 130cm high. A captive Sumatran rhino lived for (at least or more than) 32 years and 8 months. There is no information on wild Sumatran rhinos. You need to upgrade your version of Adobe Flash Player to view this. This video footage is the property of WWF-Malaysia. Downloading, reproducing, distributing, storing or using of this material in any form for any purpose is strictly prohibited. The Sumatran rhino is found in a wide variety of habitats, from lowland rainforests and swamps to mountain moss forests. It seems to prefer hilly areas near water, particularly steep upper valleys with thick undergrowth, as well as secondary forest where the upper canopy is broken and the smaller shrubs and vines which it feeds on are more plentiful. The Sumatran rhino moves seasonally, staying in hilly country when the lowlands are flooded during the rains, descending when the weather has become cool near the end of the rains, and returning to high ground. The Sumatran rhino can climb up and down steep slopes with great agility. It swims well and has been known to swim in the sea. Males are usually solitary, while females are found in mother-offspring groups. Sumatran rhinos are solitary animals that only come together to breed. Gestation is 475 days with one calf per birth. The calf is covered with a dense coat of reddish hair. Calves, weaned at 18 months, stay close to their mother for 2 to 3 years. A birth interval between calves is 3 to 4 years. Females reach sexual maturity at 4 years while it takes males 7 years. Captive rhinos live to around 35 years. Sumatran rhinos feed before dawn, after dusk and move about during the night. A healthy diet consists of diverse tropical plants. These browsers eat up to 50 kg of leaves and twigs of young saplings and small trees. They also feed on fallen fruits and are reputed to prefer figs and wild mangoes. Rhinos visit natural mineral concentrations or salt licks, possibly to obtain salt and to socialise. The population of the critically endangered Sumatran rhinoceros keeps shrinking and numbers have declined to an alarmingly low level. It is estimated that there are less than 20 rhinoceros left in Borneo. Major threats include poaching, illegal encroachment into key rhino habitats, and the fact that the remaining rhinos are so isolated that they may rarely or never meet to breed. A high proportion of females evidently have reproductive tract problems while many of the remaining rhinos are old and possibly beyond reproductive age. Essentially, the death rate may exceed the birth rate.